Can matchmaking create happy homes for employers and migrants in Lebanon? BEIRUT - When Jane came from the Philippines to Lebanon as a domestic worker to cook, clean and care for children, she only met her new boss on the day she moved into her house - and was unhappy from the outset. Meanwhile Beirut resident Tina, expecting her first child, was looking to hire help at home but was worried about employing someone she had never met - as is usually the case in Lebanon where foreign workers need a sponsor to come to the country. Enter Leena Ksaifi who runs Equip, the first non-government organization in Lebanon to play matchmaker between employers and migrant domestic workers in a bid to tackle worker abuse and trafficking and ensure both bosses and workers are happy. Ksaifi said she wanted to shake-up traditional recruiting in Lebanon where people go through agencies and rarely meet workers in-person before hiring them under the kafala sponsorship system, which binds migrant workers to one employer. Jane and Tina - whose names have been changed upon request for privacy - said they didn't want to get into an employment relationship again that was decided on a photo and resume so they turned to Beirut-based Equip who matched them. "I wanted to see her, meet her, before I made a decision. At the end of the day this person is living in my house ... it is pretty intimate," said Tina, who also wanted to avoid the large fees of hiring from overseas. "I don't want somebody to come here and be a slave," she told the Thomson Reuters Foundation in her Beirut home. Jane needed a new sponsor after deciding not to move abroad with her previous employer's family but wanted her next job to be a mutual agreement of salary, hours and time off. "I wanted to meet the person face-to-face. Before, I could not ask for what I want," she said, adding that her previous sponsorship felt like somebody owned her. Equip was set up in late 2016 but started direct hiring about six months ago as the kafala system - that applies across the Arab world - comes under increasing scrutiny and criticism from human rights groups for exploiting workers and denying them the ability to travel or change jobs. This criticism has led to some nations reforming the system, with countries like Bahrain and Jordan introducing flexible visas that stop workers being under one sponsor, according to the International Labor Organization (ILO). Migrants - mostly women - account for more than 80 percent of domestic workers in the Arab states which is the highest percentage globally. 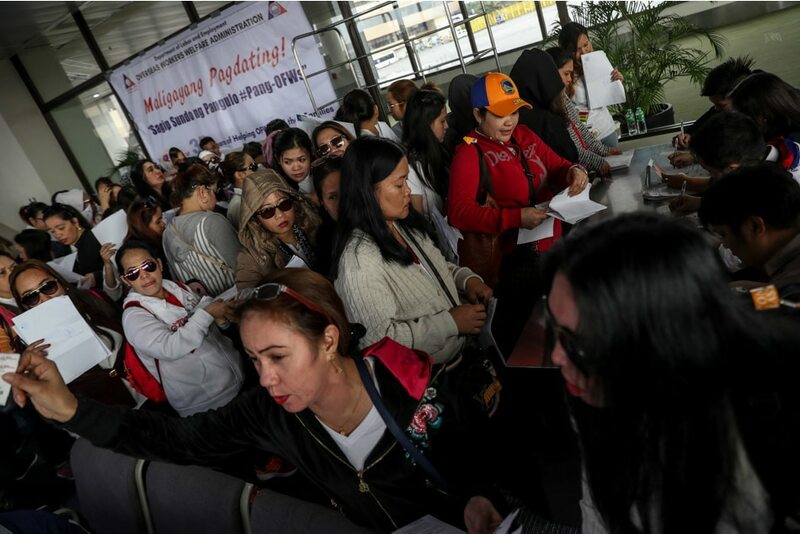 A 2015 report from the ILO showed globally there were 11.5 million migrant domestic workers, accounting for 7.7 percent of all migrant workers, with 73 percent of jobs held by women. In Lebanon there are more than 200,000 registered migrant domestic workers, according to 2017 government data. There are no official records of trafficked or abused domestic migrant workers in Lebanon. Lebanon has yet to introduce any changes to the kalafa system and Ksaifi said Equip was only matching domestic workers already in Lebanon with legal sponsors. But she hoped this would reduce the possibility of trafficking because employers and workers have direct contact with each other creating "open communication". "Matchmaking is important because it is the first step in ensuring a positive relationship ... there are aligned expectations, transparency of salary, care, etc," she said. "It ensures safety for the employer and worker, and there won't be abuses." There are more than 500 licensed recruitment agencies in Lebanon, according to Ali Amin, the president of the syndicate for recruitment agencies in Lebanon, who acknowledges that the recruitment process is not perfect. Amin said recruiting agencies can charge employers up to $4,000 depending where they are hiring and workers' experience but agencies can only connect migrant workers with employers in advance if contact information is given in the origin country. "(The system) could be better by educating the Lebanese sponsors and workers about workers' rights - and to be more open and clearly inform workers about their duties," he said. Zeina Mezher, ILO migrant specialist, said matchmaking did not solve the problem of forced labour on its own but did give "the base for an honest relationship", adding laws were needed. Migrant domestic workers in Lebanon are excluded from the Lebanese labour law, and groups working with migrants are concerned that the kafala system leaves people with no legal right to escape abusive bosses or poor working conditions. "It is important to make sure that it is matchmaking into a decent job opportunity, in a labour market that is equipped to protect labour rights," said Mezher. For Ksaifi the process starts with the employer writing a job advert that is circulated to migrant leaders in Lebanon. Any interested domestic workers are interviewed by phone and only introduced to the employer if deemed a good match. Only the employer pays a fee once a match is made with Equip so far only making four matches but Ksaifi is confident this will increase. "It sets the tone for professionalism in a sector that was never seen as an employment relationship," said Ksaifi, 32. "Both parties should come out of this as winners. Workers can feel empowered and supported, and employers can feel liberated - these two people need to support each other."